If you’ve intentionally clicked through to an article about accounting, you’re a brave soul indeed and I salute you. Not too many people get excited about accounting but it can be one of the best changes you make for your business. So many business owners neglect keeping organized books of their sales and income then wonder why they can’t put a finger on cash flow problems. The fact is, accounting can be easy if you get over the knee-jerk reaction to this science of numbers. I’m going to walk you through the three financial statements in business accounting. There are a few points you absolutely want to pick up while others won’t be required to track the most important goings on in your business. It’s up to you how far you take your new accounting skills. Accounting is the language of money. I’m conversationally fluent in Spanish and I’ve tried Russian but I’ve never enjoyed learning a language like I enjoy counting money. Accounting is more than just writing down how much in sales you made and your profits. It’s a science of financial analysis. 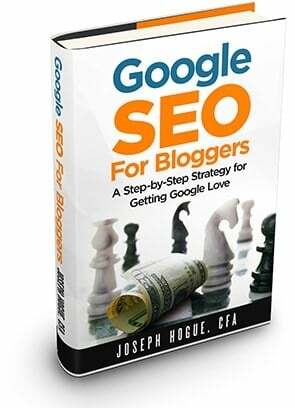 Keeping detailed and consistent books for your business will help you pinpoint opportunities for a competitive advantage over your peers and help spot problems before they put you out of business. Financial statement analysis and forensic accounting is a big chunk of the Chartered Financial Analyst exams. 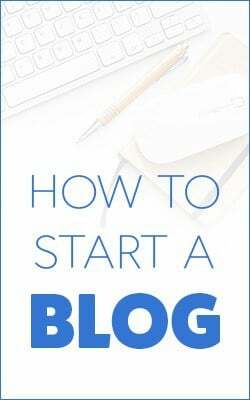 I dreaded every page until I learned everything I could do with it. Why is accounting for small business important? Accounting is important for any business because it helps entrepreneurs make informed decisions. It’s the language of money because it’s used to interpret all the financial detail within your business. If you can’t at least ‘get by’ in the language of accounting, you’ll never be able to understand what your business is saying…screaming at you to fix. That may be true but there’s a few very good reasons why you need at least a working knowledge of accounting. Nobody is going to work as hard for your business as you do. Your accountant will do their job and may do it well, but their motivation will end at the paycheck. Accountants are expensive and most small business owners can’t afford to have their books reviewed every month to stay on top of the opportunities. You have to be able to analyze your business and it needs to happen more than once or twice a year. Your accountant might not be that good. They might be fine at doing your taxes each year but can they do a full accounting analysis of your business? Can they tell you how your sales and costs are running against competitors or where your financial advantages lie? “But I do my own accounting through business software.” Great and there’s some very detailed software out there but you need to understand what’s going on behind the clicks to understand how to get the most out of it. Even if you use an accountant for your business, or if you are having trouble understanding how to use accounting to improve your business, try finding a business mentor to help you get the most out of it. Your accounting software can crunch the numbers for you but you still have to tell it which numbers to crunch and figure out what it means. Just a few accounting definitions to work through before we get to the easy steps that will turn you into a numbers nerd…have your pocket calculator ready! A general ledger is just a single record book where you account for all your business transactions. In the past, this would mean a page for sales and a few for different types of expenses. Today, your general ledger is usually a one-screen entry in some accounting software. 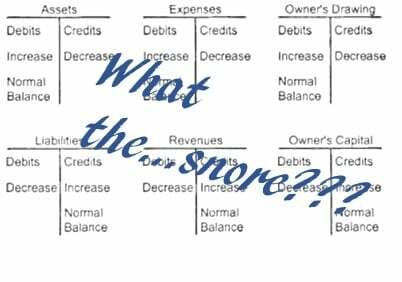 From the general ledger, the separate transactions get summed according to groups and carried to the three financial statements. If you remember your accounting class in college…I’m sorry. College business courses were the worst for teaching practical accounting. Has anyone ever used those T-accounts? These T-accounts did serve a purpose though to teach you double-entry accounting, the idea that there are two sides to every transaction. Double-entry accounting is a lot easier in practice than it is to learn. We’ll look at it in detail with the financial statements below but just remember that every transaction has an equal and opposite record…it’s Newton’s undiscovered law of business! The balance sheet is a snapshot of your finances at a given point in time. It’s a picture of all your assets, debts and ownership profits at that exact moment. The balance sheet is split into three sections; assets, liabilities and owner’s equity. Assets are things that can be converted to cash or used to run the business. These can be things quickly converted to cash like investments and receivables from customers or long-term assets like property, real estate and equipment. Liabilities are everything the business owes from short-term debts like wages that have been earned but not paid, stuff you bought on credit and long-term loans. Owner’s equity is the business profits you haven’t yet taken as compensation. The most important thing to remember about the balance sheet is that the left side (assets) must always equal the right side (liabilities plus owner’s equity). You don’t need to start your accounting with every item you see here. We’re trying to make this as easy as practical to start so just work on the basics below. Assets are either current, cash and things that can be converted to cash within a year of normal business, and fixed assets which are long-term items. Most small businesses won’t have issued stock so the owner’s equity section will simply be a single line item of retained profits from the business. 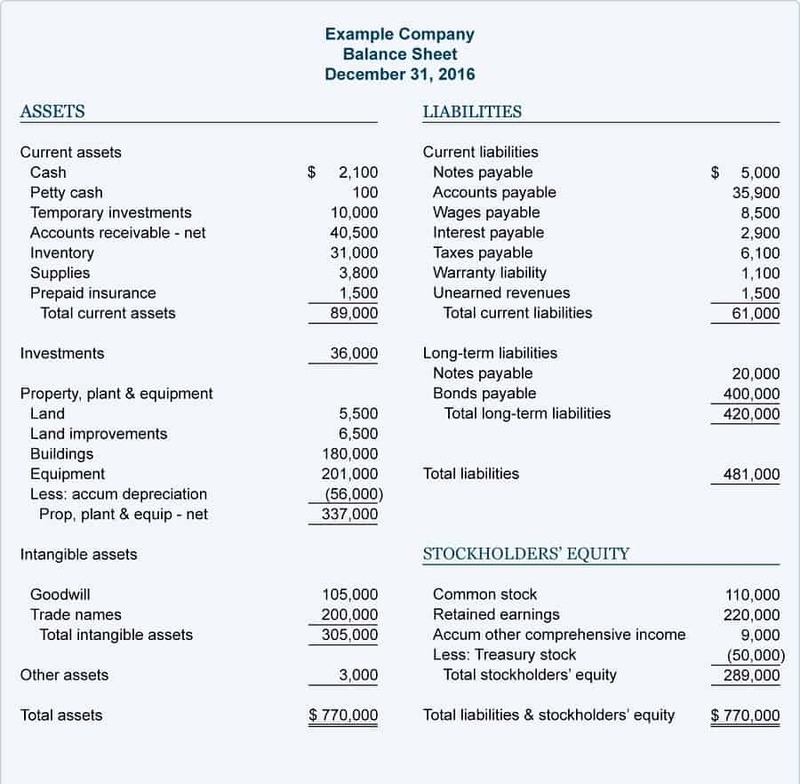 Keeping track of the balance sheet is easy when you understand what everything means. If you pay any of your liabilities, that payment has to come from somewhere. If you take delivery of materials but have 30-days or more to pay, you better be keeping track of that too. You don’t have to balance your balance sheet out every day or with every transaction. It is more a once a quarter exercise or maybe once a month at the most unless you’re using computer software that does it for you. The most important financial statement for your business is the income statement. 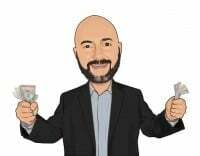 I’d say you can definitely get away with not keeping a Cash Flow Statement and maybe even without a Balance Sheet but you absolutely must record an income statement. The income statement, also called the profit and loss statement (P&L), shows your financial performance over the period. It tracks the conversion from product to profits all in one sheet. The income statement will not only help you save money on taxes but is the ultimate guide for improving your business. 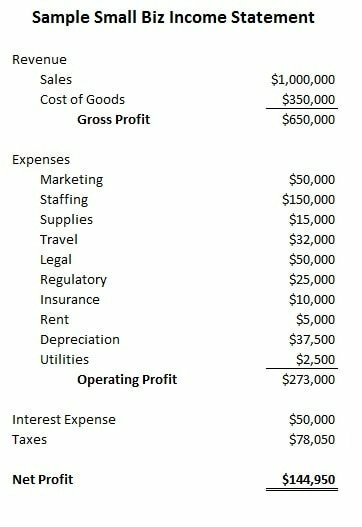 I’ve included a sample income statement here with all the typical accounts for a small business. You’ll see most of these rolled up into single line items like Selling, General & Administration but its best to be as detailed as possible. Breaking everything out individually will allow you to track it over time and see where you’re spending too much money. Your income statement starts with Sales or Revenue, hopefully there are some. The cost of the materials you used for your sold product is Cost of Goods. What’s left after is your Gross Profit. Track this to see how much you are paying to suppliers. Is it going up or down relative to your sales and could you negotiate a better deal? Your expenses are all the costs involved in running the business. As with all the items on your income statement, track them over time and as a percentage of sales. This will give you an idea of price increases over time for your expenses and if any are getting out of hand compared to what you’re making in sales. Sum all your expenses and take that from your gross profit. This is your operating profit and the pure profit from running your business. You’ll see a lot of people put the interest expense in with operating expenses, above the total for operating profit. This isn’t right. Your operating expenses and profit are a measure of how well you run your business, not your ability to use debt. You don’t want to include interest expenses so you can see exactly how profitable the business is on its own. Taking advantage of the tax deduction for interest expense is important though so you’ll need to account for it. Reduce your operating profits by interest expense before you figure out how much you owe on taxes. What’s left after taking out taxes is your net profit, the bottom-line. Too many business owners focus solely on their net profit. It’s important, I get that, but it includes the effect of financial leverage and taxes on the business. Pay closer attention to your expenses and operating profit for a real picture of your business. The entire goal of your income scorecard is to align your sales with your respective costs to tell if you are making any money or not—your net profit. But sometimes you make an investment in a large asset such as a building or piece of equipment that costs a lot of money. If you would subtract the cost of this asset all at once, it would be impossible to tell if you are profitable or not. The reason for this is simple: These large assets produce value across a long period of time. This period of time is known as the “useful life” of the asset. Taking a large cost such as that of a piece of expensive equipment and expensing it across it’s useful life is called “depreciation.” Depreciation is known as the reduction in the cost of your equipment due to wear and tear over the passage of time. You account for depreciation by dividing the cost of a long-term asset into years, usually from five to 30 years. You then take this amount as an operating expense each year and deduct the value from the asset on your balance sheet. Besides just giving you a more accurate measure of how your business assets produce profits, depreciation is a powerful tool for decreasing your taxes. 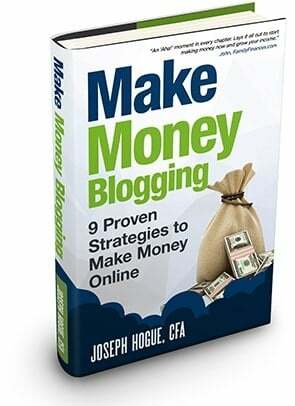 Understand how to use it and rock your bottom line! I’m going to fly through the cash flow statement because honestly it isn’t as important for most small business owners. It’s important for larger businesses and there are things to learn from it but keeping a cash flow statement isn’t critical like the income statement or even the balance sheet. The accounting purists will disagree with me but we’re trying to keep this as simple as possible. In accounting, this is called the “Cash Flow Statement,” or the “Statement of Cash Flows.” A cash flow statement is the financial document that presents income actually received and expenses actually paid. 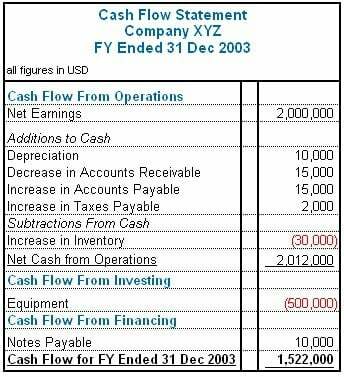 This statement (usually modified for a small business) usually shows beginning cash balances, cash inflows, cash outflows, and ending cash balances. Just because you booked revenue or an expense on your income statement doesn’t mean any cash changed hands. You might not have to pay the expense for months or might have already bought the equipment you depreciated years ago. The cash flow statement reconciles all the accounting mumbo-jumbo into cold, hard cash. The cash flow from operations reconciles your net profit recorded on the income statement with all the non-cash expenses like depreciation and working capital. These expenses reduced your net profit but didn’t involve cash going out the door so you add them back to find the real cash generation power of your business. Next, you account for the cash changes in buying or selling long-term assets as investments in your company. If you do record a cash flow statement, this is an important item to track how much you are reinvesting in your business for future growth. Finally, you will record all the cash changes for financing which includes borrowing or repaying debt. The ending cash balance on any cash flow statement is carried over as the cash balance to your balance sheet. This number is calculated by taking the beginning cash balance for the accounting period, adding any sources of cash, and then subtracting any uses of cash. The important thing in accounting is to not let the terms and formatting of the financial information scare you. If you’ve ever balanced your checkbook or even mentally thought through how much you have in the bank, you’ve done some accounting. Small business accounting doesn’t have to be complicated. Make it as easy as you need to keep your books consistent and let them help you make your business as successful as it could be. 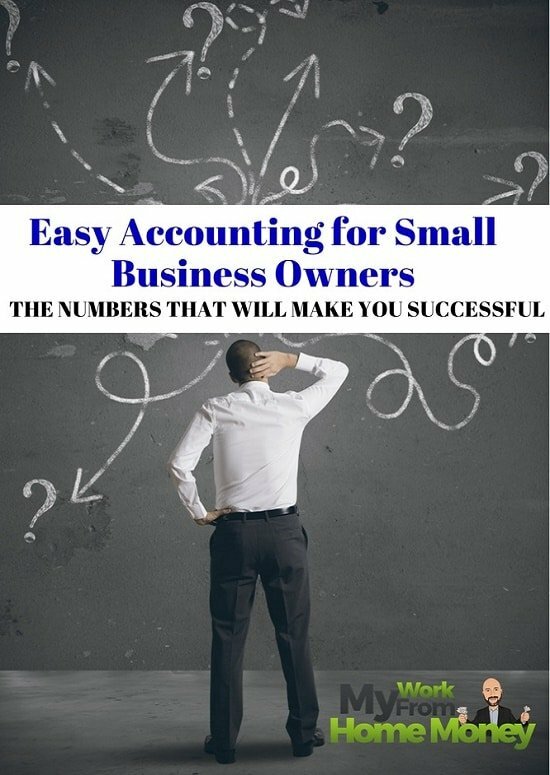 I just wanted to thank you for helping me learn more about accounting for small businesses. I actually didn’t know that you should balance the balance sheet maybe once a month or so. Definitely sounds like it could be good to make sure you have a reminder of sorts so that you don’t miss this, especially if it can save you a lot of time in the future.